Missed on Titans, Manly and Tigers... angry at missing Eels as we had them all week and changed on Friday, but Raiders and Roosters probably should've won their games so we can't complain with 5. Solid so far... but not spectacular sorry. 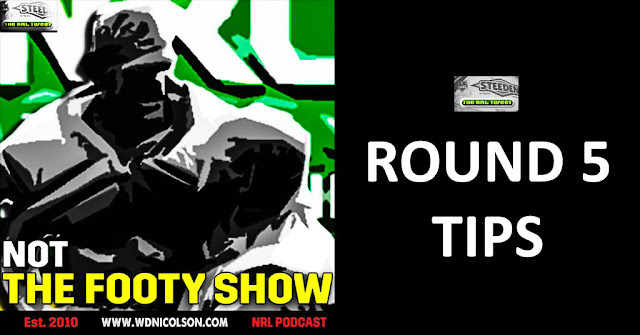 Round 5 Tipping Skinny: Storm and Cowboys should win... the rest of the games aren't easy though! Truly wavering on Sharks, Roosters (but hey the Warriors have only 1 win so they aren't on fire), Panthers and Raiders but hardly convinced on Souths and Brisbane. Good luck kids - if we change our mind we'll update.